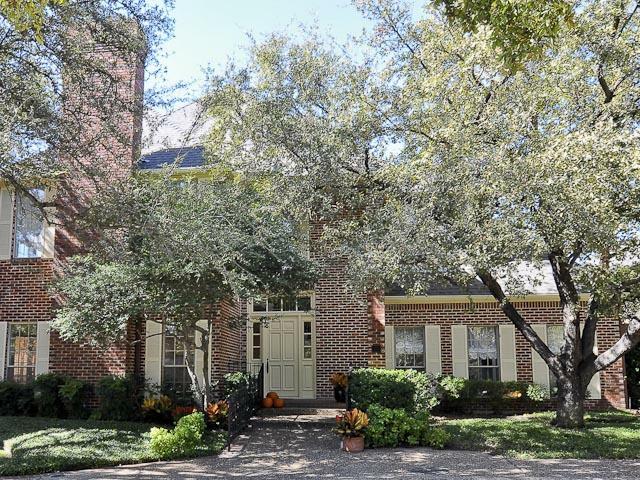 This lovely Preston Hollow traditional two story with great drive-up appeal is situated on a quiet cul-de-sac block in coveted Glen Lakes in Dallas. The downstairs features large, gracious formals with tall ceilings, a wood-burning fireplace, and French doors opening to the side grounds and courtyard. The downstairs master suite features an adjacent study and two bathrooms with excellent storage. The kitchen is appointed with an island, stainless appliances and also flow to a breakfast room, which opens to a lovely patio area. The upstairs has a wonderful large open living area with wet bar and many built-ins and two well-proportioned bedrooms with baths.